WASHINGTON- House Speaker Paul Ryan (R-Wis.) said President Donald Trump should not interfere with Independent Counsel Robert Mueller’s Trump-Russia probe. “I think the best case for the President is to be vindicated by allowing this investigation to go on thoroughly and independently. So I think the best advice would be to let Robert Mueller do his job,” Ryan said in response to a question at a news conference on Tuesday regarding reports that several Republicans have urged Trump to fire Mueller. 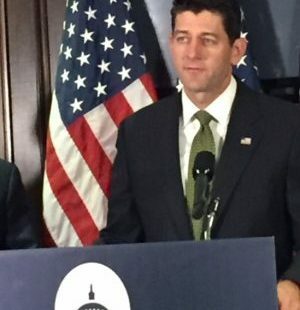 Ryan shutdown a reporter’s dual question inquiring as to whether he had spoken with Trump about retaining Muller and also whether Congress would consider amending the Independent Counsel statute should the President relieve Muller of his duties. “You’re creating a debate that’s not occurring here. This is something that I think was a rumor that came out last night,” the Speaker insisted. Deputy Attorney General Rod Rosenstein last month appointed Muller as independent counsel in the Trump-Russia probe following two days of intense bipartisan criticism stemming from The New York Times reporting that recently fired FBI Director James Comey wrote a memo about a February meeting with President Donald Trump. During the meeting the president reportedly told Comey that he hoped the Bureau would not pursue the investigation into former White House National Security Adviser Michael Flynn. Comey on Thursday told the Senate Select Committee on Intelligence that Flynn was in legal jeopardy at the time President Trump asked him to halt the Bureau’s probe into Flynn. Comey also told the committee that he authorized the leak of the existence of a memorandum documenting the February meeting in which Trump made that request so as to highlight the need for the appointment of a special prosecutor. Comey told the committee that during the meeting in which he was allegedly asked to drop the Flynn investigation that Sessions had left the room. Comey then said he requested that Sessions never again leave him alone with President Trump. Sessions is scheduled to testify Tuesday afternoon in open session before the Senate Select Committee on Intelligence.